The Play Framework drastically improves developer productivity without sacrificing scalability. 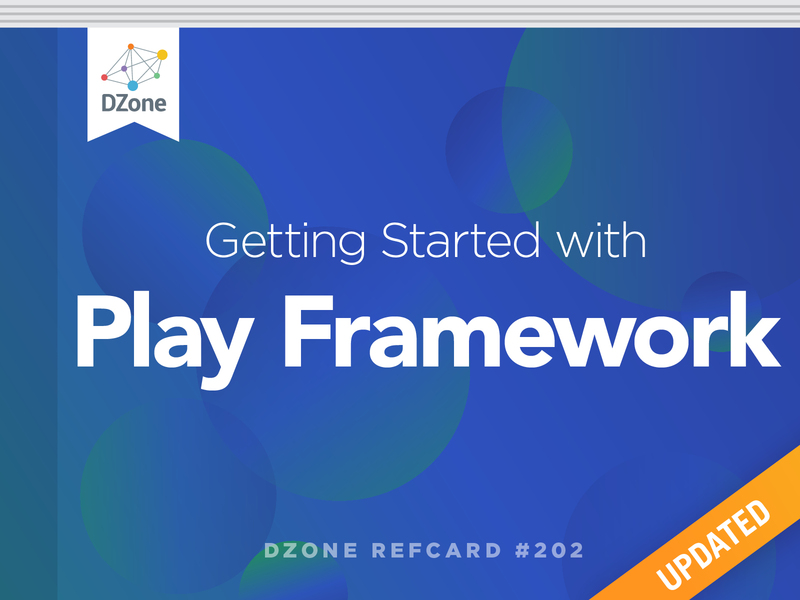 In this Refcard, learn how to create a new Play app, how to utilize controllers in Play, and how to manage routing requests within this web framework. The Play Framework is a high velocity web framework for Java and Scala that enables a highly productive workflow but doesn’t sacrifice scalability. Play features a “just-hit-refresh” workflow that enables a rapid development cycle. The compilation and application reloading happens behind the scenes. Play is built for the modern web by being non-blocking, RESTful by default, and having built-in asset compilers for modern client-side technologies like TypeScript, CoffeeScript, LESS, and more. Download one of the sample projects. Unzip it and run "./sbt run” command in your terminal. Your new Play application should be running and you should be able to browse to localhost:9000 and see your new application. To get to the local documentation for Play, navigate to localhost:9000/@documentation. After that, you can either use a basic code editor or import your project in IntelliJ or Eclipse by using ScalaIDE. app The app source directory for Java, Scala, and client side source code. conf The config directory containing the route mapping, application configuration, and log configuration. test The test source directory. You can have both Java and Scala sources for your backend code. However, Play has an idiomatic Java API and a separate idiomatic Scala API because the idioms differ between the two languages. This creates an experience that “feels right” with whatever language you use. The packages in Play for Scala begin with play.api while the Java API lives under the Play package prefix. Only valid HTTP methods are allowed. If you change GET to FOO, you will get a compile error indicating that FOO is not a valid method. Paths can also use regex expressions to limit what they match on. The query string parameters are type-safe, so if you set the type as Int, then there will be an error if the parameter cannot be converted to an Int. You can also have default and optional parameters. One of the reasons that Play compiles the routes file is to provide a reverse routing API so that you never have to hard code URLs into your application. Instead, you call a method in the reverse router, which returns the route defined by the “routes” file. This enables you to easily refactor your URLs without breaking your app. By extending the base play.mvc.Controller class, we pull in some convenience methods, but doing so is not required. The controller instance is created by using Guice, a dependency injection framework. The get() method returns a play.mvc.Result, which represents the HTTP response. In this case, the response is a status code "200 OK" response because the ok helper was used to set that status code. There are many other helpers like notFound and badRequest that wrap the general purpose play.mvc.Status API. The response body in this example is just a String, but it could also be HTML content, a stream, a file, etc. The primary difference with this Scala example is that the controller returns an Action which holds a function that takes a request (optionally specified) and returns a response. Just as the Java controller, by default, we use dependency injection to create an instance of the controller. It can be provided by Guice or it can use compile-time Dependency Injection. The controllerComponents instance injected has a number of built-in utilities so that we can have simpler controllers, but as long as you have an Action, it will work. ctx() Returns the HTTP context, which can be used to retrieve and store data relevant to the current request. flash(), flash(String key), and flash(String key, String value) Can be used to access a state that is only available for a single request after the current one (this is useful for displaying messages after a redirect). session(), session(String key), session(String key, String value) Can be used to access the session state which is backed by a cookie. request() Return the current HTTP request object, which can be used for reading HTTP request headers, body, and any other data related to the request. response() Returns the current HTTP response object, which can be used to set cookies, HTTP headers, etc. Interceptors can be added to controllers in order to add security, logging, caching, and other custom behaviors. This is called Action Composition. In Play’s Java API, annotations are used to add the interceptors. In Scala, Action Composition is achieved through functional composition. Controllers go much deeper than the typical request and response handling. For instance, a controller can return a stream or it can be used to setup a push connection (Comet, EventSource, WebSocket, etc). Controllers can also handle more than just HTML; they can be used for JSON, binary files, or any content type using custom Body Parsers. The Scala templates include a number of other features and patterns, like reusable HTML components, including forms via the @form function. One of the huge benefits of the Scala templates is that you will see compile errors in your browser just like you do with controllers, routes, and everything else that is compiled by Play. These examples show serializing and de-serializing an object. Both the Java and Scala APIs in Play have methods for traversing a JSON structure to locate and extract data, as well as methods to create and manipulate JSON structures. At first glance, it seems that these assets are being read directly out of the file system. However, doing so would make Play applications more difficult to deploy since Play uses a container-less deployment model that is ultimately just a bunch of jar files. Instead, Play’s built-in Assets controller serves assets from within the Java classpath. The public directory is actually a source directory that puts its contents into a public package in the classpath (or generated jar file when creating a distribution). Given the previous routing definition, the reverse router will resolve that to the /assets/images/favicon.png path. // app variable is provided by WithApplication. You can run the tests either using your IDE or from the command line using sbt test. See more about how to run tests with sbt here. You can specify additional config files to deal with configuration that varies between environments. Play’s config system is built on the Typesafe Config library. See more about how Play uses it here. Note: For Scala projects, make sure to use PlayScala instead of PlayJava when enabling plugins. This changes some defaults in Play’s template compiler to make it more idiomatic Scala. libraryDependencies += "group" % "artifact" % "version"
libraryDependencies += "mysql" % "mysql-connector-java" % "6.0.6"
Play’s build also supports sub-projects so that you can partition your application into multiple smaller pieces. This can improve build times and make different pieces more easily reusable. Unzip it and run \"./sbt run” command in your terminal. By extending the base play.mvc.Controller class, we pull in some convenience methods, but doing so is not required. The controller instance is created by using Guice, a dependency injection framework. The get() method returns a play.mvc.Result, which represents the HTTP response. In this case, the response is a status code \"200 OK\" response because the ok helper was used to set that status code. There are many other helpers like notFound and badRequest that wrap the general purpose play.mvc.Status API. The response body in this example is just a String, but it could also be HTML content, a stream, a file, etc. libraryDependencies += \"group\" % \"artifact\" % \"version\"
libraryDependencies += \"mysql\" % \"mysql-connector-java\" % \"6.0.6\"